Prone to hypoglycaemic episodes? That’s low blood sugar. Always check your blood glucose before driving. If it is lower than 90 mg/dL (5 mmol/L) have a snack, wait 30 minutes, then check again. 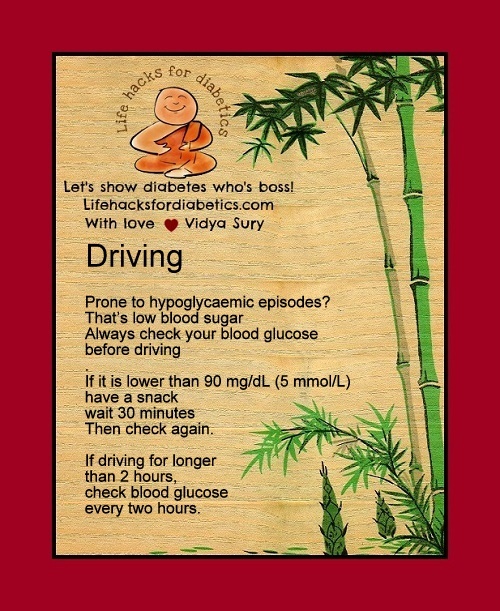 If driving for longer than 2 hours, check blood glucose every two hours. I can always feel my blood sugar level dropping, usually when I forget to eat (but don’t worry there is enough of me to cope). Interesting post Vidya. Thank you. Hi Vidya, they are some good little tips. Our health is so important!